This Series began from a Facebook post – any surprise – those regular to this Series will know it to be not at all. The subject of Salvation is paramount to what DeliverTheWord.com stands for and is set to do – be a witnessing tool and Encouragement to those who will be impacted by it – around the globe. Our lives are to point to our Saviour, Heavenly Father and our Faith as we go about even our most routine tasks. Right here is where I am going to lose a few folks – we NEED to realize that EVERYTHING we DO is being watched by at least two Somebody’s. There is NO such thing as having a “time-out” in a Christian’s life economy, because God the Father doesn’t have a “time out” level He puts in His Economy. Our Lord and Saviour didn’t clap His hands together or form a sideways “T”, then yell “TIME-OUT” when it came to Calvary. Each of us as Christians have a life to live that is honoring to our Creator, Sustainer and Saviour – which doesn’t change because a person works for the telephone company, a mechanics shop, a retailer, a security company, an attorneys office or a sales oriented workforce. REMEMBER: Our lives count, our actions count, our words have impact, how we handle situations matter, our affections can be just the thing that another person needs to see, here and know the impact of on others – desperately. At the risk of just stating the obvious, life for human beings, as well as majority of God’s Living Creation, blood is a required to sustain life. Blood is the life continuing mechanism which allows the body to function correctly and efficiently. Most of us understand that sacrifices were required before Jesus came to be the Saviour of the world, where blood was required in a very specific manner to be shed for remission of sin. The final Sacrifice required the Blood of the Son of God, Jesus Christ – there is where the REAL Power lies. The Resurrection Power was possible because of the Power in the Blood of Christ, which was the purchase price of Salvation of all mankind – to us, it translates to the Spirit of Life in Christ Jesus. This entire Series is based upon the Bible Truths presented in that Hymn with full support from the Scriptures. 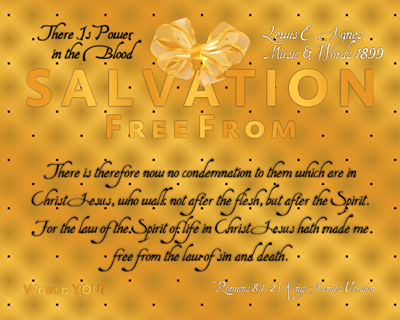 There are a total of twenty-four (24) prints in this Series, of which seventeen (17) prints were developed from the Hymn which it is based: There Is Power in the Blood, by Lewis E. Jones in 1899. What a precious gift we have been given, the Gift of Salvation! What is it that Salvation gives you and I? The list, which looks like quite a bit, is just barely scratching the surface of what Salvation gives each of us on a daily basis. There is something of the most high importance to be considered, which is this: “Others will base what they think Salvation is, solely on how they see you and I live our lives.” Are others seeing the benefits of Salvation being lived out in our lives? Or, are they getting mixed signals because we are different in representation based upon where we are at any particular moment. We should be about our daily lives as if Jesus were right there beside us – oh wait, He ALREADY is for the Christian! We are the Temple of the Holy Spirit. Let each of us start with the list above today – seeing how many of them apply to us and which of them others can see.